Tomorrow, March 17, 2018 isn't just St. Patrick's Day; it's also National Quilting Day! and an apron full of baby bunnies! even just a wee bit of green will be 20% off! additional 5% off all things green! Sale applies to in-stock, regular price items. Some exclusions apply. By now you have probably seen the Cake Mix Recipes. You've likely seen patterns and quilts that use them, but have you tried them yet? Have you seen how they simplify precise piecing? Cake Mix recipes by Moda work with Layer Cake 10" Precuts. 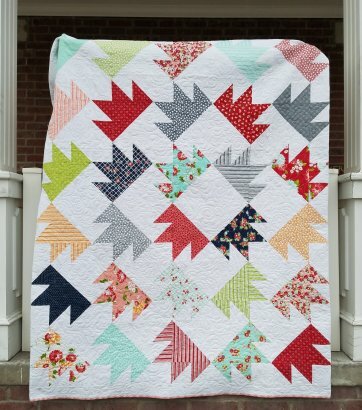 By layering precut fabric squares with a Cake Mix Recipe paper, you can simply stitch along the printed lines, cut as indicated and tear the paper away to create perfectly accurate quilt blocks! Emily Herrick made this Gingerbread Quilt using Cake Mix Recipe 1 and enjoyed the method so much that she is offering to teach a class! Emily invites you to gather your ingredients – a Layer Cake, a Cake Mix Recipe and The Cake Mix Recipe Book I - all available here at the shop. 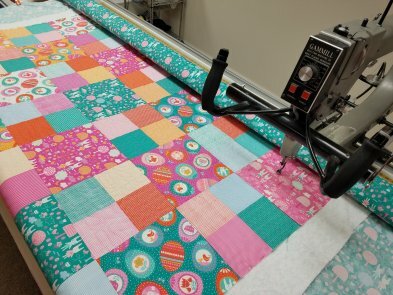 You chose the Cake Mix quilt you want to make and she will provide the instruction and assistance plus LOADS OF FUN! Additional ingredients may be needed depending on the quilt pattern chosen. Register in-store, on-line, or over the phone. $30 class fee. 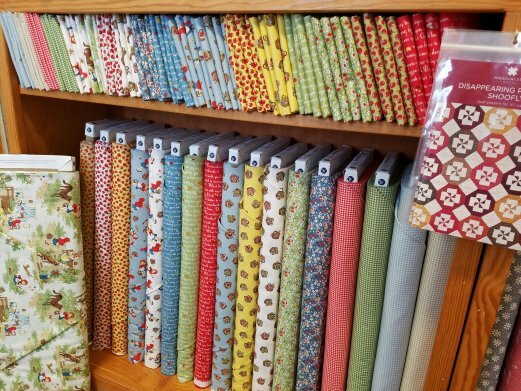 All supplies must be purchased separately and are available here at Corn Wagon Quilt Co.
For more information on this and other classes please click the link below. It's a story we all grew up with; the tale of a girl in a red hooded cape on a journey though the woods to visit her grandmother. "Whistler Studios brings this fairytale to life with their new fabric collection, Little Red Riding Hood." Drawing on 1930s inspiration, this darling collection features a main print of little Red encountering the wolf, a tossed basket print, tiny gingham, apples, flowers and a word print of well-known quotes from the tale. 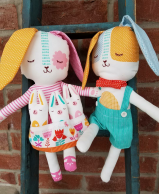 Clink the link below to view each fabric up close as well as find free project downloads on Windham's website (I think I have to make To Grandmother's House!) then make your own journey to visit us at Corn Wagon (wolf-free guaranteed) and create your own quilt story! March 19th - 25% off one cut of fabric! This sale includes regular price cotton, flannel, minky & wool cut from the bolt. $ 2.25 ea. to reflect the increased regular price of fat quarters of $3.25 ea. Wednesday's Word is a special offer for our Facebook Friends and Instagram Followers. Every Wednesday you can find our social media post announcing Wednesday's Word. Repeat the word at the register that Wednesday to receive 25% off one regular priced item. Remember, Facebook & Instagram feeds are no longer shown chronologically but you can simply bring up our profile to view our posts at your convenience. Hint: the more often you click on our posts, the more regularly we will appear near the top of your feed.